This recipe is from Doña Petrona, an Argentine cookbook. Alfajores are a family Christmas tradition.. Note: There is an * on Dulce the Leche! that is because you can either buy a jar of Dulce the Leche or YOU CAN MAKE YOUR OWN!!! I like making my own because if I do, I end up with Dulce de Leche which is simply milk and sugar, with no additives. It takes a bit of time, but little effort. There is a caveat!!! Do look into the cooking of the Dulce the Leche from time to time and monitor the water level. Do not allow the water to evaporate! If the water evaporates and the can is still cooking, it will explode! To make your own Dulce the Leche, buy a can of condensed milk, removed the label, and place in a tall pot of water which covers the can plus 2-3 inches. Using this much water is key because the water will cook down with cooking. Bring the water to boiling, then reduce the heat and over a medium to high simmer, cook for two hours. Turn off the heat, and when the water cools, remove the can of condensed milk, allow to cook completely, then open the can. You should have perfect Dulce the Leche. Don’t open the can while the can is hot or you will have a mess on your hands! Beat sugar and egg yolks until light and fluffy, about 5 minutes. Add melted butter and grated lemon rind. Sift dry ingredients together and beat into the mixture. Chill dough for at least 2 hours or overnight. Place the chilled dough on a floured surface. Roll to 1/8 inch thick. Cut with a round 2 ½” cookie cutter. Place on greased cookie sheets and bake for 10 minutes. Transfer cookies immediately to cooling racks. 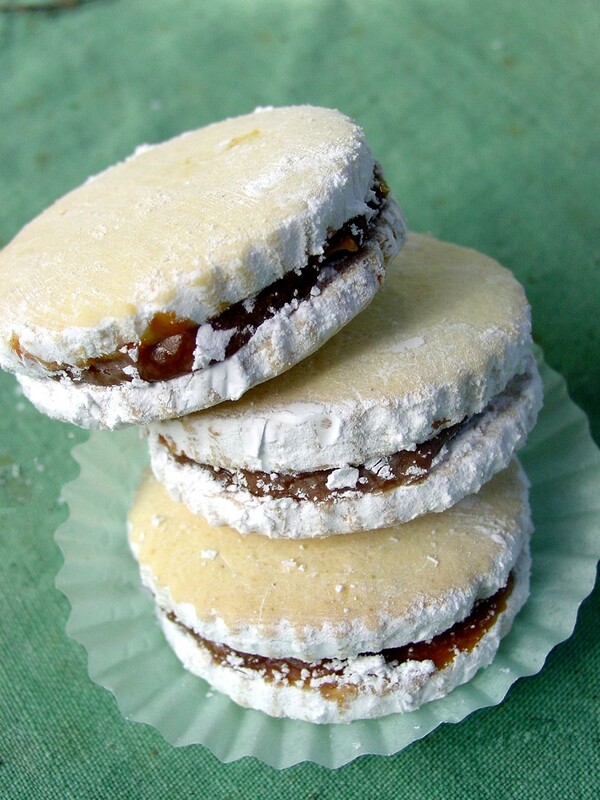 When the cookies are thoroughly cooled, spread dulce de leche on a cookie. Top with another cookie making a sandwich. In a paper sack filled with ½ cup confectioner sugar, drop 5 or 6 sandwich cookies at a time and shake gently to coat.